What can you teach channel partners to solve customer problem? Home → Uncategorized → What can you teach channel partners to solve customer problem? 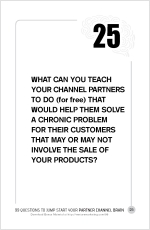 What can you teach your channel partners to do (for free) that would help them solve a chronic problem for their customers that may or may not involve the sale of your products? Here’s an experiment you can try at home. Take a process you know well and create a corresponding flow chart. That’s step one. Step two is writing down the questions you ask at each decision point. Step three is to teach it to your children or spouse. For example, let’s say you’re someone like my father-in-law, Jack Bolt. Jack is an absolute car buying grand master. He can walk into any dealership and negotiate down to their lowest price. It’s a skill. No emotion or crazy stuff, like a former client who brings a van load of toddlers to the dealership and hangs out all day until he gets his price… true story. Jack has a process of questions he asks the sales rep and the sales manager to get to best price. It’s like watching someone peel an onion, layer by layer. Only Jack sheds no tears. As you might guess, Jack’s honed his process over many years. He knows the line of questioning to follow based on the responses he gets to earlier questions. You could say he approaches it similar to a game of chess, thinking several moves ahead of his opponent. Perhaps your process is about how you keep organized or diagnose a kid’s illness. Whatever it is, I promise you can create a map of questions anyone can be taught to follow and when they do, they’ll arrive at the same place you would have. It works for your Channel Partner sales reps. A properly synchronized set of questions help reps guide customers to the best solution for customers—especially for considered purchases of capital equipment. It’s what solution selling is all about. To bring this to practical application I asked Susan Pryor Welter to explain just how she does this for her Channel Partners. 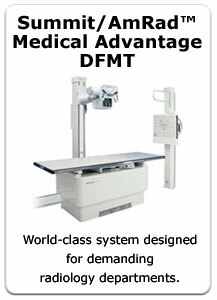 Susan is Director of Sales for Summit Industries, LLC, manufacturers of the AmRad™ Medical X-ray equipment brand. Summit sells exclusively through Channel Partners. “Teaching your channel partners to focus on moving the buying trigger from lowest price to best solution helps the channel partner to properly manage the customers’ expectations. The chronic problem here is that customers are frequently disappointed enough in their purchases to not become a repeat buyer of the exact product or through the same channel. This leads to inconsistent after-sale service, higher learning curves within the customer’s business, higher employee frustration, poorer customer service, a shortfall is solving the problem and ultimately, less profitability. It also erodes the potential sales on the part of the channel partner. Keeping in mind that best solution has price as one of its major components, best solution also requires the channel partner to differentiate themselves more than they do their products. Let’s face it, there are very few innovative ideas that are not quickly met by a “me too” product unless protected by an impenetrable patent. In addition, there are usually only a few really best solution options for any one set of circumstances. Without a substantial differentiation in the products’ features and benefits, the differentiation comes in the form price and of how the product gets supported. Focusing on price does not guarantee that one is getting the best deal in a “me too” product offering.